In addition to high-profile theatrical premieres, projects and festivals the year of 2015 will be remembered as a time of social struggles. Russian theatre-makers are openly talking about the threat of the revival of censorship. One example of this was the mass rally "For the freedom of artistic expression and creativity" that took place on April 5 in the city of Novosibirsk and was attended by more than three thousand people. Shortly before that, on March 29, another rally took place with no less number of participants, under the motto “Let us save Russia by protecting the shrine". The rally was initiated by Orthodox activists and its participants stood up for protecting religious rights and demanded that creative freedom be restricted. Both rallies were held in response to the new production of Richard Wagner’s opera Tannhauser that premiered at the Novosibirsk Opera and Ballet Theatre in December 2014. The production of Tannhauser directed by the chief conductor of the Novosibirsk Opera Ainars Rubiks and one of the popular young Russian theatre directors Timofei Kulyabin was recognized by all influential Russian media as a significant artistic event of the season and one of the most interesting opera productions created in Russia in 2014. However, the predicted pilgrimage did not happen: the production caused protests of Orthodox believers, and eventually was removed from the repertoire. In the interpretation of director Timofei Kulyabin the main character Heinrich Tannhauser appeared as a modern film director shooting his new movie "Grotto of Venus" about an unknown period of life of Jesus Christ. According to the script, Jesus Christ spent these years in the monastery of carnal pleasures. 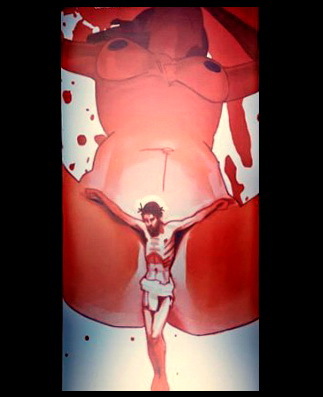 The action takes place at the filming location, in the action studio where the film director is living and working and which is decorated with the film poster depicting Christ between the huge female legs. Most of the Orthodox activists did not see the performance, and their indignation was caused only by the fact that Christian paraphernalia were used in such a liberal manner. Even more they resented the poster. After numerous complaints, the Metropolitan of Novosibirsk and Berdsk Tikhon appealed to the prosecutor's office demanding institution of administrative proceedings against the creators of the opera production on the grounds of an insult to religious feelings. As a result of the litigation and based on the opinions of outside experts who confirmed that "the religious symbols and attributes are presented in an artistic context, and therefore are not sacred", the case was dismissed for lack of evidence. The Russian Ministry of Culture, however, instructed the Novosibirsk Opera House management to apologize to the audience and to make amendments to the production. Managing director Boris Mezdrich to ignore the instruction, and his contract was terminated. The new managing director appointed by the Ministry made a decision to remove Tannhauser from the repertoire. These developments caused a number of public outcries from both the opponents and the supporters of the production. St. Michael Cathedral issued an appeal to the leadership of the Republic accusing the production of "The Blizzard" staged at the local Russian Drama Theatre based on the novel by Alexander Pushkin of "an insult to religious feelings of believers". The priest was unhappy with "an ugly and overemphasized " cross and with interpretation of the character of the priest (although episodic) presented in an insulting manner. Earlier, in January, a number of social and Orthodox activists in the city of Samara published an open letter in which they demanded punishment and dismissal of the chief director of the Samara Academic Drama Theatre Valery Grishko for the fact that he played the role of the bishop in "Leviathan". In their view, the film is "a slanderous opus presenting the country and the Orthodox Church exclusively in black colours." Russian Government bodies, including Ministries and Departments of Culture are obliged to respond to such appeals and lawsuits, since the vast majority of theatres in the country are repertory theatres and are largely contained by the state budget. Also, in 2013 a tougher version of the law "On insulting the feelings of believers" was adopted that provided for heavy fines and criminal penalties of imprisonment for "public actions, expressing obvious disrespect for society and committed with an intention to insult the religious feelings of believers" (Article 148, Criminal Code). Even before the law was adopted it was criticized for a number of things, including unclear criteria of the concept of "public insult of feelings". Opponents of the law were also saying that the line between insult to feelings and reasonable criticism is quite thin and cannot always be clearly defined. With regard to works of art, including theatre productions, addressing religious subjects, they may get priority under the law. Although the law applies to all beliefs and religious groups, Russian human rights activists noted, in particular, growing clericalism of the Orthodox Church, which, according to its adherents, presents itself as the main proponent of patriotism in the country. To a large extent, the growth of patriotism in Russian society in recent years has been caused by state foreign policy, in particular by complicated relations with Ukraine and EU countries. Radical patriots are increasingly criticizing the current public policy in the field of art. As an example, the analytical online resource “Stoletie” ("The Century") published an extensive 18-page long article entitled "Maydan-stricken Theatre". The article heavily criticizes the edition of the journal "Theatre" exclusively dedicated to the situation in Ukraine and to the Ukrainian theatre. According to the author of the article, all publications in the issue have a clear anti-Russian coloring. "Theatre" is the key professional journal entirely dedicated to theatre issues published by the Russian Theatre Union and financed by the RF Culture Ministry. The author of the article therefore wonders why the state budget should support “an anti-patriotic publication that calls for "total Europeanization" of the Russian theatre and whether theatre-goers living far from Moscow and St. Petersburg would indeed be happy with such "Europeanization". The article is based on emotions rather that on reasonable and professional analysis. It mainly contains echoes of patriotic radicalism and appeals to reconsider the principles of state support of the so-called "anti-Russian" projects in the field of theatre. The article also mentions the Golden Mask National Theatre Award, which, according to the author, adheres to the guidelines of the West European theatre when selecting the nominees. "There is a theatre festival, which year after year consistently promotes theatre productions that obviously contradict our moral standards, obviously provoke society, obviously reflect Russophobic sentiments, express contempt for the national history and consciously go beyond the moral boundaries. When the classical literature is reduced to coarse instincts, when under the pretext of the right for interpretation, Russian classics like Pushkin, Gogol and other great playwrights are converted into anything else but classics, when we see alien values dragged on stage under a disguise of the “golden mask” - I mean the Golden Mask Festival in case it is still not clear to someone – the question is then: should the state continue to support such festivals in the same way they are supported now? Probably, it should not». This is a quotation from the speech made by Vladimir Aristarkhov, first Deputy Minister of Culture, at an official departmental meeting. Later on the Ministry press service in response to mass media inquiries indicated that deputy minister expressed “his personal opinion and that the official position of the Ministry is under consideration." Nevertheless, the opinion of such a significant functionary as the first deputy minister, was understandably taken seriously, and raised fears about the future of the national theatre award. The Golden Mask management claimed that "preservation of the Golden Mask Award and Festival is directly linked to the task of preservation of nationwide theatre space. Our mission is to prevent disintegration of the theatre community environment and keep the artistic sphere clear of political wars. We strongly believe that we should concentrate our efforts on maintaining a dialogue and mutual respect of people of culture." As a result of discussion it was decided that the boards of experts who make selection for the national award should be formed with equal participation of the Theatre Union and the Ministry of Culture. In October 2015, the list of members of the new Board of experts was announced. The composition of the new Board immediately provoked a negative reaction from theatre critics because a number of members were included as a result of pressure from the Ministry of Culture. Altogether 93 theatre critics from twelve Russian cities wrote an open letter addressed to the Theatre Union demanding dissolution of the new Board of experts “to prevent further scandals which will be unavoidable”. “We should not forget that the "Golden Mask" is a professional award given by the theatre community and not by the Ministry of Culture. All decisions relating to the future of the Golden Mask must be taken by the Theatre Union, in the first place, and not on the basis of the so-called consensus with the Ministry. " The next step taken by the community of critics was creation of an independent Association of Theatre Critics aiming "to support the theatre art and promote professional expertise, free of bias and ideological pressure". Moscow theatre critic and culture expert Alyona Solntseva in the analytical article "What is Happening with the Golden Mask" assumes that the collisions and negative reactions related to the situation around the Golden Mask represent the current tendencies of the national cultural policy actually aimed at the return of censorship rather than disagreements and disputes inside the professional theatre community. "In fact, we witness quite an important process when the functionality of the system undergoes transformation, and clear signals are being sent as to what is expected of the theatres in terms of repertoire, selection of authors and the choice of the audience. Theatres are being notified that those favored by the Culture Ministry will be encouraged by travel grants, possibilities to participate in festivals, tours, grants, and other benefits. Those who stubbornly persist in experimentation, in creating socially sensitive performances and who insist on the right to hold a different opinion will be punished by slashing their budgets and, in extreme cases, termination of contracts." The new winners of the Golden Mask National Theatre Award will be announced in April. Coming back to Tannhauser, it should be noted that the production was included in the Golden Mask “long list”, but for the above-mentioned reasons failed to be nominated. Time will tell whether this pessimistic forecast is accurate. In the coming year the changes and trends in relations between the theatre, society and the state are likely to show up more clearly.